Multi-Well Standard: 1/16", 1/8", 5/32", 3/16", 1/4"
Multi-Well Standard: 1/16", 1/8", 3/16", 1/4", 3/8"
The Ametek ETC could be the world's fastest Dry Block Calibrator! The Ametek Jofra ETC Dry Block heats up by up to 100 Deg C/212 Deg F per minute and completes a full dual-point test in less than 10 minutes, including stability time; timesavings at your fingertips! The ETC- series is designed for field testing of temperature measurement devices. The small size and light weight make it a perfect instrument to verify sensors in difficult to reach places. 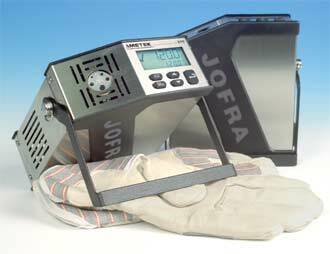 All JOFRA ETC units have many of the same useful and timesaving features offered in the more advanced JOFRA dry-block series. who perform tests and verifi cations of temperature sensing devices in the field. This instrument is ideal when time is a critical factor and the highest accuracy is not a critical factor. 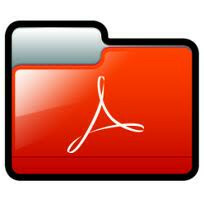 are important considerations because the unit is able to fi t into a tool box or instrument carrying case and can be used for sensors that are difficult to access. Stainless steel and rubber side panels make the instrument suitable for many years of faithful duty in an industrial environment. The ETC-400 A is designed for optimum speed. The heating block is built around a highly efficient heating element. The insertion holes for the temperature device under test are located around this element. To reduce mass and increase effectiveness, there is no removable insertion tube; the holes are drilled directly into the block. The minimal mass offers an extremely fast heating and cooling time. The different layouts also make it possible to use an external reference probe during the calibration. Choose the combination of holes that best suits your needs from our various design combinations. 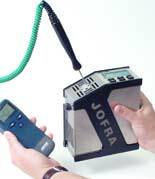 If your application requires a dry-block that can handle large sensors or more than one sensor at a time, we offer several other JOFRA dry-block calibrators that can meet your needs. Easy-to-use, intuitive operation - All instrument controls are accessed directly from the front panel. The main functions on the ETC- series are designed with one-key-one-function logic. This means that there are no difficult multiple keystrokes to remember to access primary functions. The easy-to-read, backlit display features dedicated icons, which help in identifying instrument conditions and operational steps. The Up and Down arrow keys allow the user to set the exact temperature desired with a resolution of 0.1 Deg C or Deg F.
Stability indicator - The bold checkmark on the display indicates that the calibrator has reached the desired set temperature and is stable. The operator may change the stability criteria and establish a greater level of confidence in the calibration results as desired. A convenient countdown timer is activated three minutes before the unit reaches stability. This prompts you to be prepared to record results. Auto-stepping - This feature saves time. The operator may stay in the control room, or another remote location, monitoring the output from the sensor-under-test while the ETC- series calibrator is placed in the process and automatically changes the temperature using a programmed step value and rate. Up to 9 different temperature steps may be programmed, including the hold time for each step. This feature is also ideal for burning-in new sensors prior to installation; this minimizes initial drift and allows for initial testing. It is also useful for testing temperature data loggers. From the setup menu, you can select a lower maximum tempe-rature limit for the calibrator. This function prevents damage to the sensor-under-test caused by the application of excessive temperatures. Instrument setups - The ETC-series stores the complete instrument setup, including: engineering units, stability criteria, resolu-tion, auto-step settings, and maximum temperature. Re-calibration/adjustments made easy - The ETC- series has a very easy and straightforward procedure for re-calibration/adjustment. There is no need for a screwdriver or PC software. The only thing you need is a reliable reference thermometer. Place the probe in the calibrator and follow the instructions on the display. or other dry-block heating and cooling sources. Using the software's »SCENARIO« function allows for combining instruments in virtually any configuration.